Sections of the Assabet River in Hudson and Stow were trash patrolled today under surprisingly pleasant weather conditions. I was joined by a friend visiting from New York and he was getting his first look at this particular stretch of the Assabet River. 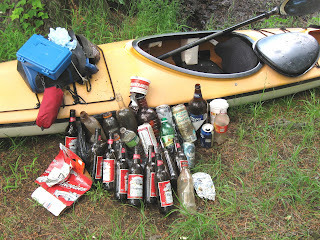 Amongst the Adirondack Pirates with whom he usually paddles he is known as 'Captain Dangerous'. We launched at Cox Street in Hudson and paddled downriver to the village of Gleasondale and the dam that once powered the mill there. Along the way we saw great blue herons, red-winged blackbirds, a mute swan, a wood duck, mallards, and a musquash or two. Turning around at the dam, we paddled back upriver to Cox Street and then continued upriver to Hudson's old electric generating station on Main Street. The stretch near the old electric plant could use some more water as many shoals are developing. An additional four inches of water would be just the ticket! It was decided at this point that the lucky spell of pleasant weather we'd enjoyed was about to expire and we returned to Cox Street where the day's catch of 35 pieces posed for a photo. Today's trash broke down as follows: 20 recyclables (18 redeemable) and 5 pieces of miscellaneous rubbish. The Budweiser bottles were found at the Cox Street launch site. YTD total stands at 2810. As a faithful reader of your nautical adventures, I am captivated by your photos and knowledge of how and for what reasons the capabilities of the inland streams were put to use by earlier generations. Often wonder why they are ignored and trashed by today's world of the sophisticated and elite amongst us.